The public comment period for this particular phase of the Main Street Extension is now closed. A full public involvement report will be available in the near future. Click here for materials presented at the April 3, 2018 KC Streetcar Main Street Extension Public Meeting. 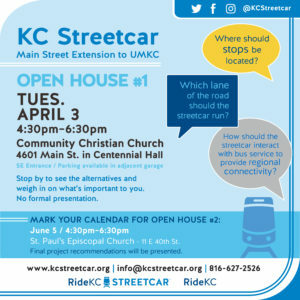 The first public meeting for the KC Streetcar Main Street Extension was held Tuesday, April 3, from 4:30 p.m. – 6:30 p.m. at Community Christian Church, Centennial Hall, 4601 Main Street. Together with the KC Area Transportation Authority and the City of Kansas City, Missouri, the KC Streetcar Authority is asking for community input at this open house style meeting. Participants will learn more about the status of the Main Street Extension and weigh in on design alternatives and potential stop locations.